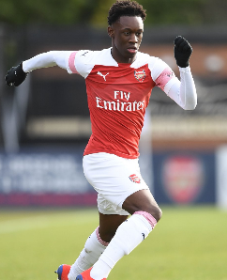 Four players with Nigerian blood flowing in their veins have been included on the Arsenal roster for the prestigious Dr Pepper Dallas Cup which got underway on Sunday at the Cotton Bowl Stadium. Right winger Ryan Alebiosu, midfielder Miguel Azeez, defender Mazeed Ogungbo and striker Folarin Balogun were part of the group that traveled to the United States. Alebiosu has been handed the number 15 jersey for the tournament, Azeez will wear number 8, while Balogun and Ogungbo will play with the number 9 and 20 shirt respectively. The young Gunners will compete in the Boys U19 Jago Super Group/Bracket B, they face C.F. Monterrey Rayados and Real Salt Lake in the group. In their opening match on Sunday, Folarin Balogun scored what proved to be a consolation as they were beaten 3-1 by their Mexican opponents. The in-form striker converted a spot kick to equalise for the Gunners in the 17th minute but the opponents went on to score two more goals.